Have you ever nodded off in your seat only to jerk your head up in alarm, wondering if your neighbor saw that drool on your chin? Or been frustrated because you really needed that inflight shuteye, but you just couldn’t get comfy as hard as you tried? 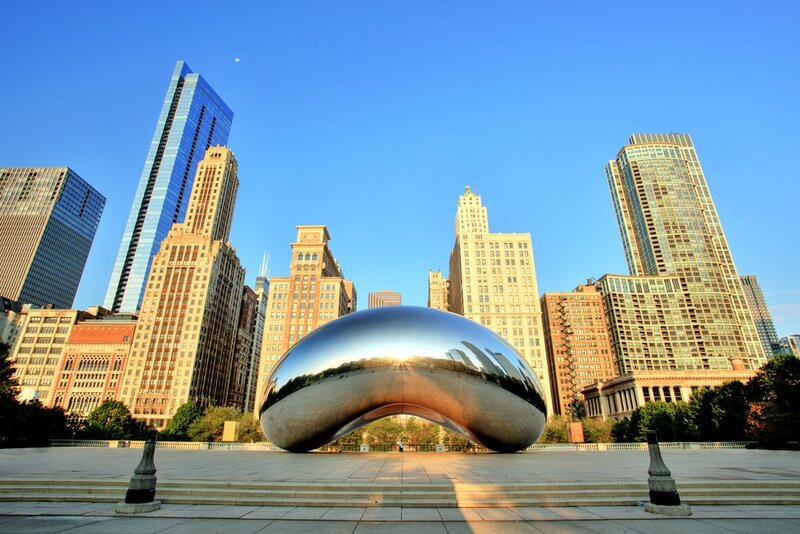 Yep — sometimes traveling can be downright uncomfortable. But is there anything you can really do to snuggle up a little easier in the air? Today we’re breaking down 14 of the best travel pillows on the market in an effort to help you nab your greatest inflight zzzs yet. The Trtl Pillow looks more like a scarf or wrap than an actual pillow. This inventive new design comes from 2 mechanical engineers who were looking to create something superior to the traditional U-shaped pillow. Simply place the ribs (this device’s hidden, internal support) up against your head and neck, then wrap the fabric portion around and velcro in place. The velvety fleece (which is hypo-allergenic and machine washable) creates a type of hammock to cradle your head and neck, so there’s no need to lean against a window…or your unsuspecting neighbor. At 0.29 pounds it’s extremely lightweight, and it folds up to half the size of a traditional travel pillow. You can start to see why this product is causing such a stir! 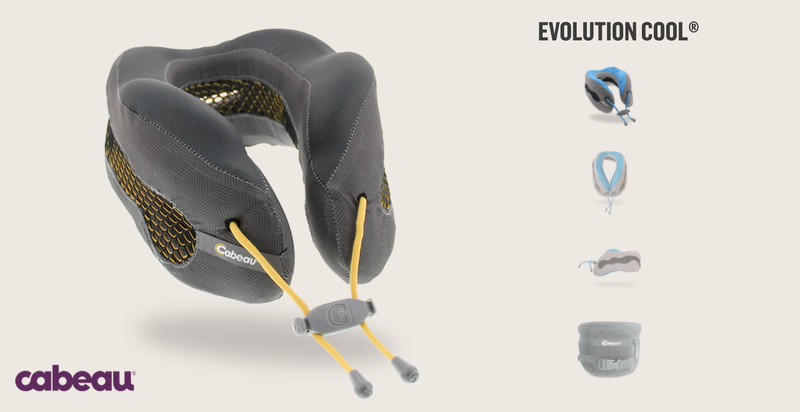 The Cabeau Evolution is one of the most positively reviewed travel pillows on the market. You may think it looks a lot like the traditional U pillow, but we encourage you to dig a little deeper into the design. This pillow is built with a responsive memory foam core in a patented ergonomic design that provides 360° of support for your head and neck. Whether you tend to bobble sideways, backward or forward, you’re covered all the way around. The adjustable toggles also help provide the optimal level of support. Additionally, the pillow’s flat back prevents the shape from pushing your head forward into an uncomfortable position. It’s a bit larger than some others on the list, but it rolls up to 1/4 of its full size for transport (carrying bag included). The soft, washable cover includes a “media pouch” for your device, and Cabeau also throws in a pair of memory foam earplugs to boot. Oh, and it comes with a 2-year satisfaction warranty. we really like this pillow: You may remember seeing this item featured on our list of Carry-on Travel Essentials for Short and Long Flights. This pillow certainly tops the list for a couple of bobble-headed sleepers here at Upgraded Points! Some people are simply hot-natured by design, so things can get a bit sticky (literally) when you’re on a plane full of people stalled at the gate without a/c for what feels like hours. Once you’re finally airborne, the air comes on, but it’s too late — by that point, you’re already sweating profusely, and the thought of donning a poly-cotton neck pillow makes you want to cry. Behold: the Cabeau Evolution Cool. This pillow has all the perks of the standard Evolution Pillow (memory foam core, flat back, 360° support, adjustable toggles, washable cover) but also includes a center portion of cooling air circulation vents to keep you refreshed. Additionally, it rolls down to 1/2 its full size to fit in its deluxe travel case for convenient packing. You get a pair of memory foam earplugs included with this one too as well as the 2-year satisfaction warranty. The BCOZZY also garners tons of great reviews on Amazon. This lightweight wrap-around pillow allows for adjustable chin support to prevent drooping. While BCOZZY doesn’t quite elaborate on what the pillow itself is actually made of, they boast a “breathable soft cover” with “bounce-back filling,” advertising a “flexible but solid structure” to use in a variety of seating positions. The entire pillow is machine washable, and it comes with a small loop and snap on the back to attach it to your travel bags. Plus, it comes in a child size with fun bright patterns like “Trendy Pineapple,” “Navy Poodle,” and “Black Skulls,” among others. The Twist Travel Pillow has a neat little design that allows you to bend the roll into just about any shape you’d like to cradle your head and lull you into a sweet slumber. While Dot&Dot doesn’t readily disclose what the main mechanism is that allows for the bend, they do state there’s a luxury memory foam core that’s covered in a machine washable cotton cover. 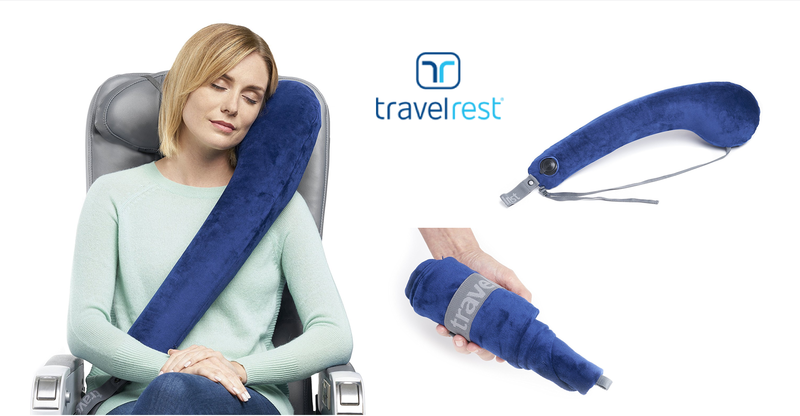 They encourage travelers to also try the Twist Pillow as a lumbar support or to relieve other pressure points while flying. Additionally, note the snap closure that allows you to secure the pillow around your neck, or attach it to your purse or carry-on while in transit. This pillow is great for Goldilocks types — those who can’t sleep until the support is juuuust right. Image courtesy of jpillow.com & J-Pillow via Amazon. The J-Pillow is another funny looking pillow that appears as if the standard U shape has sprouted an arm. It also comes with instructions…for a travel pillow…because apparently, this one can get a bit confusing. Basically, the idea is for the J to support your head from under the chin. However, the alternative uses pictured mean that whichever way you cuddle up to this awkward little guy, it’ll likely make you more comfortable. The J-Pillow is made from “high-quality 3D filling,” and has a “plush” cover. One downside to the cover is that it’s not removable and therefore is not machine washable. It does have a snap for quick on-the-go travel and reportedly compacts into a tight ball. Oh, and it won “Best Consumer Invention at the British Invention Show 2012/13,” so there’s that. 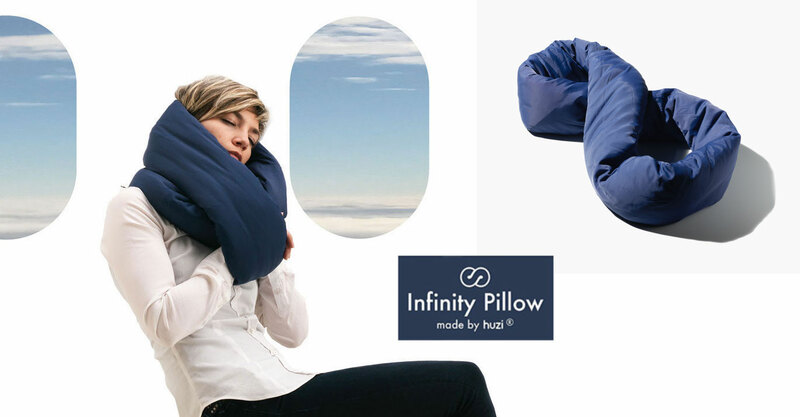 The Huzi Infinity Pillow is the coziest travel pillow on the market. Just look at it — doesn’t this want to make you snuggle up and snooze for days? This pillow balances softness and support, with a cutting-edge microfiber fill that expands and intertwines to form air pockets. Its outer cover is a bamboo fabric designed for breathability and temperature regulation, which allows you to stay cool when it’s warm and warm when it’s cool. 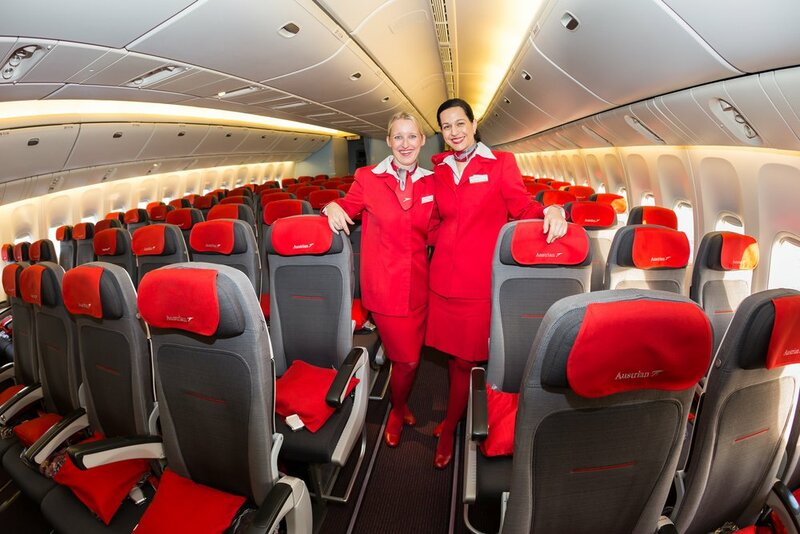 Plus, due to its unique shape, you can also use it for lumbar support, tray table sleep, snuggling, etc. While it’s a bit bulkier than some other options on this list, there’s no denying its cushy nature is worth the space it takes to pack (or wear as a plush “scarf” around the airport). The entire pillow is machine washable; just make sure to line dry. Yes, the Travelrest Premium may look strange, but it gets rave reviews. When deflated, this pillow insert (and cover) roll up tight to save loads of space when packing. When you’re ready to snooze, just give it a few puffs to inflate and then secure it with the strap to keep it in place! The whole thing deflates in a matter of seconds, so you can roll it back up and pop it in your carry-on for a quick getaway. The machine washable cover is a soft microfleece, and it comes with memory foam inserts for added comfort. Heads Up: Travel Rest also sells the original Travelrest and the cover separately on Amazon, so be careful when you purchase! If you think you’ve found a major sale, be sure it’s the right selection if you want the 2 pieces to come packaged together. Alternatively, it is nice that you can buy another pillow or cover alone if the need arises. Image courtesy of AirComfy via Amazon. The Ease Inflatable Neck Pillow from AirComfy is a great option for travelers who feel a bit claustrophobic with other pillows that secure around the neck. The Ease’s unique butterfly shape is designed to cradle the arch around the back of your neck to provide support where you need it. The Ease is also nice for those who want something slightly smaller than the traditional U (or any of the larger pillows above). It comes with a soft, removable, machine washable cover, in addition to an elastic band you can use to secure it in place around a headrest. Lastly, AirComfy encourages travelers to try this pillow out as a lumbar support too, since you can easily adjust the inflation for optimal support in this use as well. The Voyage Travel Pillow by Sondre Travel is your go-to if you’re more of a minimalist and you want some versatility. If you want something smaller than the traditional U (over 50% smaller to be exact), this little pillow can be worn in a number of different ways — even doubling as an eye mask when necessary. The band itself is a poly/spandex blend, and the pillow portion is filled with thousands of tiny microbeads. This allows the pillow to more or less sculpt to your preferred sleeping position so you can sink in and zone out. While it doesn’t hold your head up completely, it still does a pretty good job of helping you get comfortable. Plus, it’s a lot less eye-catching than a number of other options on this list. This inflatable tray table pillow’s design is mirrored after a massage chair — you know, where you sit down and place your head in the cradle. Via the holes in the side, you can slip your arms through to up the comfort level…essentially giving your new pillow a big hug. Woollip claims this pillow can be inflated with just 4-5 breaths in about 15 seconds. Plus, you can easily adjust the fill to accommodate your personal height and firmness preference. In turn, it deflates in seconds and can be folded up to “book-size” for packing. The soft, suede-like material is reportedly hypoallergenic, and it doesn’t contain phthalates or amines used in many plastics. Yay! You guys…This. Pillow. With the Z Travel Gel Dough, you literally SINK into slumber as if you’re resting on a cloud. Why gel? Malouf’s patented dough is infused with an advanced gel material that dissipates heat to help regulate your temperature. So this really isn’t your average memory foam. Plus, the pillow’s “open cell” technology allows for the perfect balance of soft yet springy support, and it’s guaranteed to last. Malouf even provides a 5-year warranty to back it up. The pillowcase is a bamboo velour that’s removable and machine washable. At 1.75 pounds, this is the heaviest pillow on the list, and while it can be scrunched down a bit, it can be pretty bulky for packing. In addition, it’s certainly better to use if you’ve got a window seat…so you may be starting to wonder why it’s even a contender here. These bright, fun little pillows are brought to you by the same company responsible for those adorable little wheelie suitcases you see kiddos riding like a horse around the airport. Both pillows come in a number of colorful animal-themed options for your little adventurer’s enjoyment! 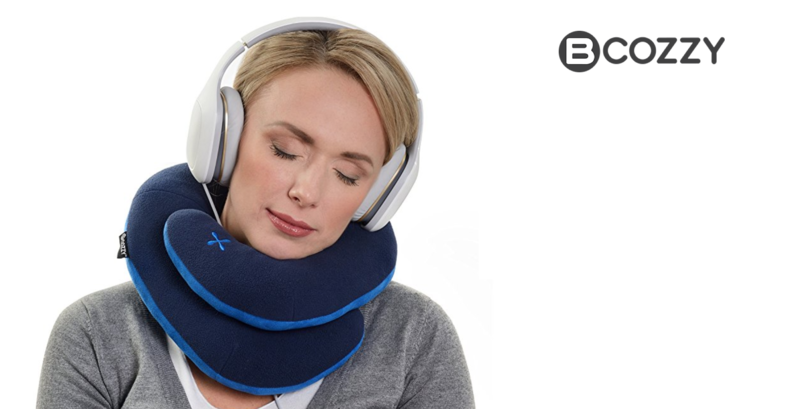 The Yondi is more of a traditional travel pillow, utilized for around the neck support with a magnetic closure at the front for safety. The SnooziHedz is a small pouch that contains an inflatable pillow and matching blanket. They both come with the standard Trunki Grip piece to keep stuff together so small hands don’t lose anything along the way. 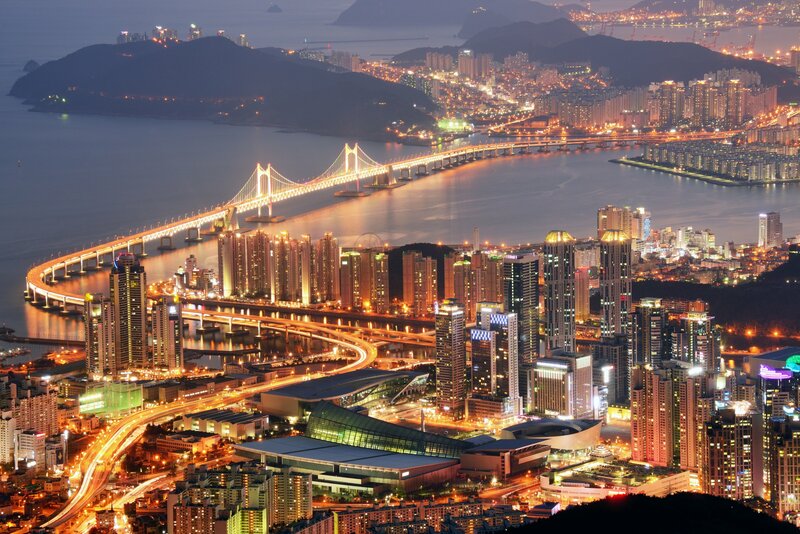 Image courtesy of Banale via kickstarter.com. Hailing from Italy, this innovative little pillow successfully raised over $250,000 on Kickstarter. The campaign is now continuing over on Indiegogo, where you can pre-order your Omni-Pillow for a fraction of the eventual retail cost. This pillow feels built for adventurers, but of course it could be extremely useful for just about any traveler. Whether you need it as a neck pillow, double pillow, or pillow topper, the certified Oeko-Tex Standard 100 Class I Fulfilled memory foam is sure to comfort you. Those are some big words, but suffice it to say that means it’s serious quality — this pillow is built for compression resistance, durability, and support. Plus, it’s anallergic and CFC/HCFC free. The pillowcase is made from material used in high-performance sportswear: it’s machine washable, light yet durable, and won’t pill over time. It’s also got a built-in sleeve for your device and a cord hole for your headphones. Also, the outer shell is soft yet sturdy AND it’s waterproof. Go go gadget pillow anyone? Did we miss your favorite Travel Pillow? Give us a shout in the comments and let us know why it should have made the list! Looking for more fantastic travel products to improve your adventures? Check out these other posts for inspiration! *Upgraded Points does not recommend any product for use within a child’s car seat without first verifying the product’s safety standards with the original manufacturer. Upgraded Points assumes no responsibility for the improper use of these products. In no event shall Upgraded Points be held liable for any special, direct, indirect, consequential injury or any injury whatsoever related to improper use of the products listed. Upgraded Points is a participant in the Amazon Services LLC Associates Program, an affiliate advertising program designed to provide a means for us to earn fees by linking to Amazon.com and affiliated sites. The Arc4life Memory Foam Travel Twist Neck Pillow is not on the list! One really great thing is that besides using it for the neck, you can use it for the lower back or under the knees.